I tend to take my bath with bubbles, but lately I have discovered essential oils, salts, and herbs. It has taken my bath from ho-hum to deserving of a Calgon commercial. Plus salts have a wealth of health benefits that bubbles just can’t seem to live up to – throw in the herbs and oil and, well…no contest! One trip to your local health food store is all it takes. There are many recipes you can make depending on the kind of day you’ve had, but if yours are anything like mine, you need the “hallelujah, I made it through the day” blend – so that is the one we will make today. At the end of the post I will give you a few more ideas to mix things up. 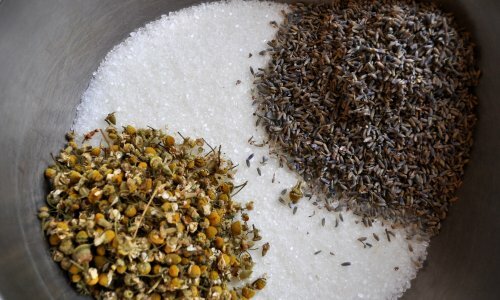 Now add 1 cup of chamomile and ¾ cup of lavender and mix well. At this point you can put the mixture in an airtight container and be done. I do this then add about a ½ cup to a wash cloth and tie an elastic around the top to toss in the tub to steep. But if your making them for gifts or just plain like to pamper yourself stick with me. Now take your tea bags and add a about a third of a cup to each. I did a quick zigzag stitch across the top with my sewing machine, but you can also seal them using an iron on the cotton setting. All done! 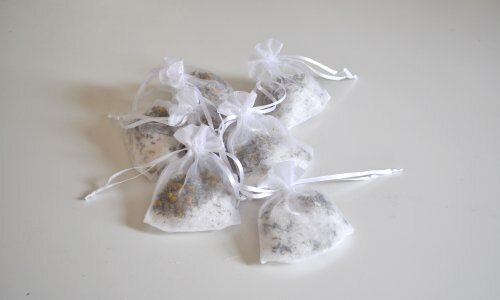 You can also add the salt mixture to organza wedding favor bags. The nice thing about this, is you can hang it over the tap and let the water run over it while the tub fills. Plus it ups the pretty factor a notch or two. 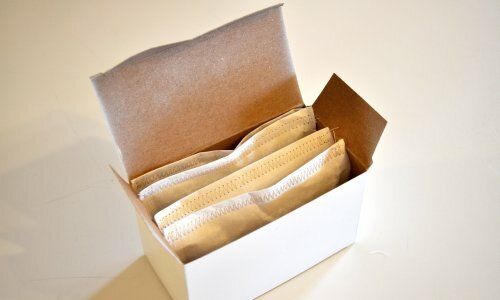 Ideally the bags should be stored in an airtight container, but I am giving these as gifts and wanted to show you a few ways you can present them. I had a few old tea boxes I saved and spray painted white. They fit four bags to a box. Add a bow and tell them to transfer them to a glass container for storage. I had a couple I will be mailing so I added four to clear favor bags and topped with fabric and a zigzag stitch. Did you know that a charm pack fabric cut is the same width as those little bags? Super convenient and a little twist to the typical bow tied on the top. They are also the perfect size for topping mason jars, so next time your at the fabric store, pick up a charm pack, I love ’em. 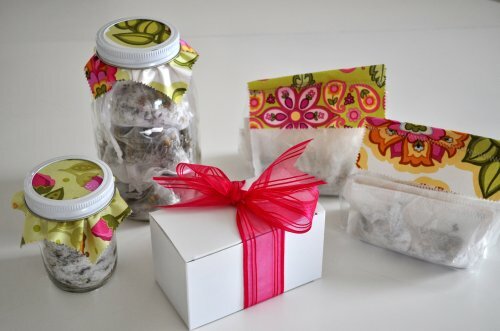 I used mason jars for the organza pouches and some loose tea as well. I added a little note saying “It’s your day…soak it up”, with instructions telling them to toss the entire bag in the tub while filling to let steep. 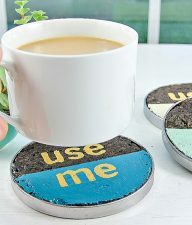 These are great gifts for Mother’s day, bridal showers, party favors… I heard you’ve had a bad week tokens. Essential oils – spearmint, grapefruit, mandarin, bergamot, petitgrain, and rosewood. 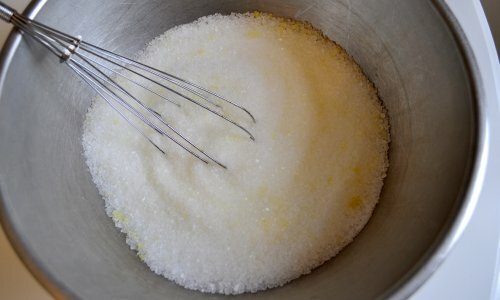 Mix in – powdered milk, baking soda, cornstarch, ground oatmeal. All of these are skin softening. Herbs – rosemary, basil leaves, comfrey leaves, rose petals, calendula flowers. 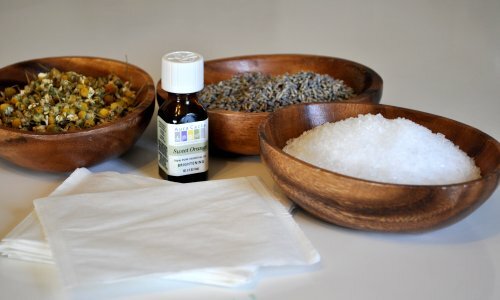 If a shower is more your thing, hop on over to The Mother Huddle for a tutorial on making invigorating salt pouches. 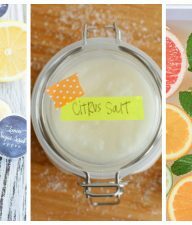 They are a great way to take the benefits of a salt bath and body scrub to the shower. Thanks for having me! Destri is a play-at-home mama who has recently discovered it is possible to sew with baby on her lap. She can be found at The Mother Huddle blog, where she and five other women write about anything from sewing tutorials, making stuff, kids crafts, recipes…and lots lots more. After a week the oil soaked through the herbs and tea bags and made a mess. Do you have a way to help them keep longer than a week? Bummer! Maybe that’s all it can handle, up to one week. Or you could possibly double bag it, although not sure how much scent will come through. Very neat. I may do some of these for my sisters, but definitely for me. what size bag is an appropriate bath size ? I’m wanting to offer them along with my bathsalts and sugar scrubs. Fab tutorial. Thank you for sharing. 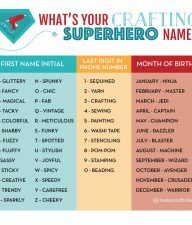 I will look out for more interesting craft ideas from you! Thanks for simple and sufficient instruction! Very nicely presented. Thank you! I love this!! I really want to make some of these up now! 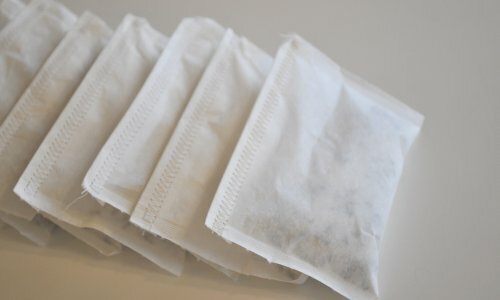 where can i find tea bags like that? Amazon actually has a good variety (I found some that have heat-seal there, like the ones above), and it seems you can sometimes find drawstring spice sachets at fine grociers. Most don’t cost much and don’t ask much for delivery if bought online, though. Hope this helps! I love this idea I want to make them for a Bridal shower favor, how many tea bags will this receipt ratio make? Thank you so very much. This is great for a single woman on a very tight budget budget. Thi will make many a gift. I love it! I’ve been making bathbombs w/the kiddos lately, but my girlie doesn’t like the flower buds floating around in the water. (I admit, they DO kinda look like bugs.) Tea bags are a great idea! 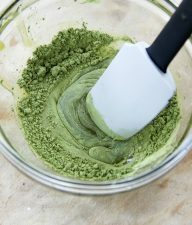 I bought mine at the Good Earth health food store, and they are so inexpensive. I believe the chamomile buds were $3 and the lavender was the same, and that makes two batches or more if you use the ratios I gave. I love this! 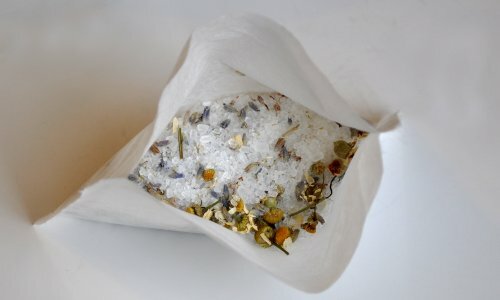 My only question is where can I buy lavender and chamomile like this? Thanks for the idea! I know this is an old comment and hopefully you’ve found your herbs by now! But in case not, and for others – not sure how far this chain reaches, but I got my lavender and some German Chamomile at Coborn’s in the organic/natural section dried bulk herbs. It was honestly like $2 for 2 cups of each. this is FABULOUS! I’m making this as a Christmas gift for a “Me Time Basket” for my sis-in-law right now and just texted my hubby to get more ingredients so I can make a double for myself so I don’t wind up stealing this part of her gift =P Thank you, thank you! I also just bought so reusable muslin spice sachets (5×7, under $5) to include in her basket so she can scoop in as-needed and I’m putting the rest loose in a jar. Another method of delivery to consider! Oh, I love this idea! 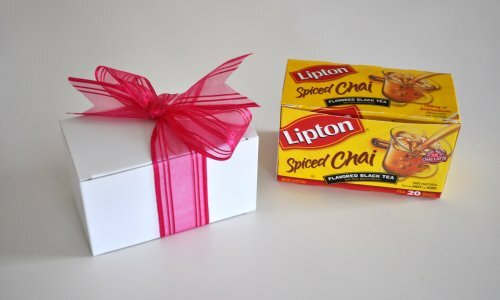 And, how cute is the recycled painted tea box w/ the pretty ribbon? What fun! I love this! I see many shower gifts coming from this idea! I want to hug you right now! Ok, first these are super cute and a perfect gift idea. More importantly… do you know how much just a small bag of scented salts are at Whole Foods? You’ll be saving me a ton of cash. Love this! Love this idea. Great for gift giving! That is such a great idea! This would be an awesome gift to give.